Because Atlanta Granite For Less partners with wholesale fabricators which buys directly from the quarries in Brazil, Italy & India and has developed a State of the Art CNC fabrication process to cut, polish and edge our granite, we are able to save homeowners and contractors literally thousands of dollars on their projects. Our wholesale pricing changes more frequently than most companies because we are always negotiating better bulk pricing discounts on our bundles of slabs. This being the case we ask you to call our sales department directly for an immediate quote on the best wholesale pricing on your project from design to finished countertops! We know after talking with us you will be able to get “Atlanta Granite For Less”! Granite is on the top of the “Consumer Reports” list as the best option for Countertops not just for its rich, timeless beauty, but also for its incredible strength and durability. The resilience of Granite makes it a practical choice, while its exquisite elegance defines the meaning of luxury. Whether you are choosing something for your beautiful new home or remodeling your current home or office, granite is an outstanding choice that adds value…..and now you can do it for price! Product doesn’t scratch, burn or break. You can cut directly on it, put things on it straight from the oven or stove, drop something on it and not worry about breaking or shattering your countertop. Top rated by Consumer Reports. Granite has the second highest hardness rating next to diamonds. Natural & Organic – Granite is a green product cut directly from the earth, where each unique piece has its own individual character and beauty. Easy Maintenance – Once sealed, you literally have a “maintenance free” countertop. More Healthy – Not a petroleum product that is omitting invisible gases and toxins. Extremely low absorption rate for less germs and bacteria trapped on countertop surfaces. More Affordable – Product is mined all over the world, but pre-fabricated and finished (polished, cut and edged) in one central location before shipping to final location. Also, because it is natural stone and not a petroleum product (corian and laminates, etc), the cost does not fluctuate with oil prices. Lasts a Lifetime – Beautiful, elegant and as solid as a rock… because it is a rock! Adds to Your Home Value – Granite is in high demand by Home Buyers and is definitely an investment which adds value (most of the time even more than your initial investment) and is considered to be a modern contemporary upgrade. 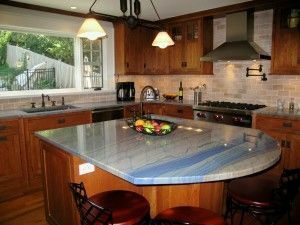 Atlanta Granite For Less has been creating beautiful, elegant interior-scapes in homes, offices, and commercial buildings in Atlanta and surrounding areas for more than 15 years. Imagine how your home will be incredibly transformed with just a little help from Atlanta Granite For Less… at way less of what you would pay at the “Depot” stores and with a better warranty!